Mobility Scooters, they are everywhere. These electric carts, somewhat like a golf cart are used by so many people, I just can’t believe it. What happened to America? Why has health here declined to such an extent? 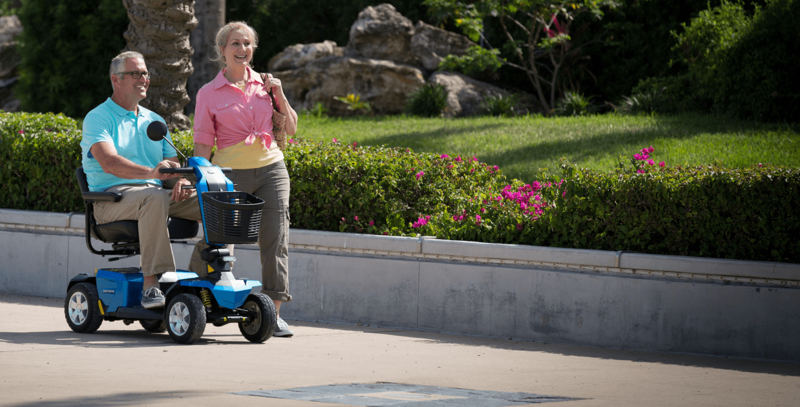 At every major store, when you come in the door they will have a huge line of these mobility scooters available for customer use. In some stores I have seen as many as 20 such scooters sitting there inside the front door, and who knows how many already taking passengers around the store. There really are a lot of personal mobility problems in the USA these days. From what I can tell, it is not that there are more old people, or it is more that a much larger percentage of the population is in poor health. I wonder why? It would seem that no major retailer would be without such scooters, because it would make the shoppers go to another store that provides mobility devices for their customers. I find it pretty shocking when I see a person using such a mobility cart or scooter for doing their shopping, and then I will see them go out to their car in the parking lot riding their scooter. They put their groceries in the trunk of their car, and then they ride the scooter back into the store to put it back where they got it. But then… they get off of the scooter and walk back out to their car. Now, I am sure there are some people that have a handicap that is not readily visible and are justified in doing that. No doubt there are people like that. However, it would seem that some of these folks are just lazy. They would rather ride a cart around the store than to walk. I really am not trying to shame such people, I just find it a big change that has happened during the 20 years that I was away from the United States. Searching through my memories, I just don’t remember stores having such devices available for shoppers back in the 90s or before when I lived here last. I am sure there were a few such places, but it does not stand out in my memory. These days, you will hardly find a large store that does not provide this kind of option for their customers. A related issue that I can’t believe is the amount of TV advertising for pharmaceutical items. Different drugs. 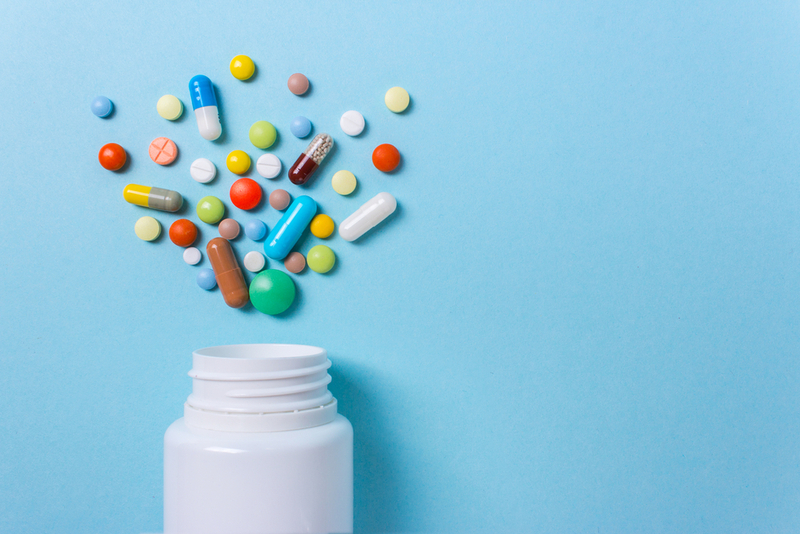 Drugs for diabetes and every other condition out there. Statins for the heart. Pain relievers. Eye medication. Drugs are Everywhere, and they don’t seem to be healthy! Again, is this a product of the population aging? I don’t know, but it does not seem so. The really surprising thing on these drug ads is that they start listing the side effects, and it probably takes half of the ad time to just tell you what might go wrong. I mean, just listening to the warnings would scare me away. Many of these drug warnings on the ads even say “death is possible”. No thanks! For anybody reading, if you have been living here in the United States over the past couple of decades maybe you can tell me what has led to this issue? Is it from a poor diet, or poor food (like GMO items) being sold here? Lack of exercise? Or am I wrong, and it is due to the aging of America? Share your thoughts, I’d be very interested in knowing how all of this came about. Besides America becoming handicap while you were gone, America also became lazy. As they say, it is what it is. So sad. Yes, that is another thing as well. I will be writing about that in a future post. There are indeed a lot of lazy people around these days. There are still hard working folks as well, but the country is a lot lazier too. 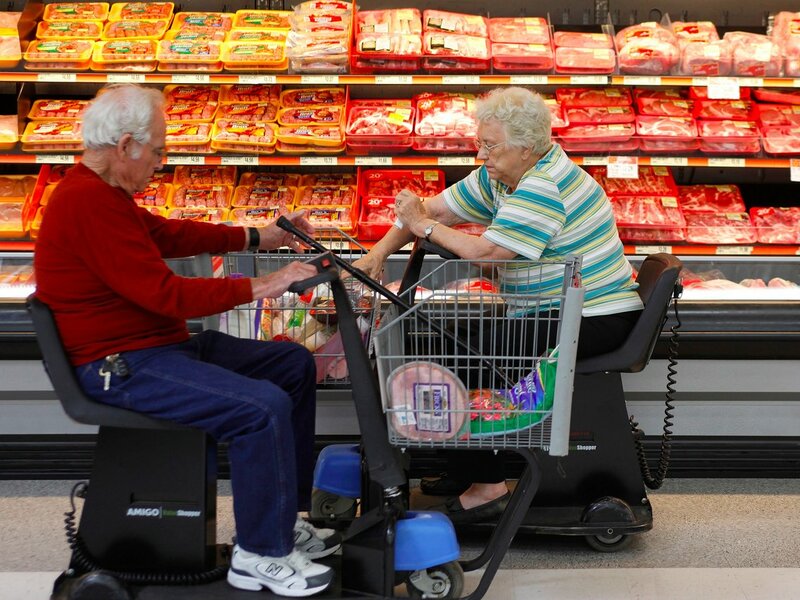 The electric carts may be due to advances in technology and competition from other stores. For example if your store does not provide them another store will and attract customers away from the store that does not provide them. Those drug commercials list possible side effects maybe to avoid lawsuits such as saying ” we told you so “. Yes, the ” baby boomers ” like myself are aging and I think we comprise a good bulk of the population these days. Additionally I think many of us have become distracted away from activities that involve any kind of exercise. We never used to have hundred channel tv or the internet that makes us sit for hours at a time. I stopped buying cable tv a few years ago because I am too busy on the internet to watch TV LOL. Diet ? Sure, years ago we did not have Microwave Ovens and other conveniences to have more food available so fast as well as instant this and instant that to feed ourselves while turning into a couch potatoe to watch hundreds of cable tv channels and movies on the internet. I am sure after you are here longer Bob you will notice more changes. Welcome Back to the USA ! Hi Bob – I feel that things like this lead to more health problems, not less. Having to walk around the grocery store is at least some exercise. The side effects of the drugs listed on the ads? Yeah, I understand why they put it, but it is shocking. I do notice changes every day, and some are shocking, others are to be expected. I believe it to be a variety of all issues along with laziness. So I believe you are right on point. I have seen some very young people driving them around collecting groceries a time or two. And it was usually because of a serious broke leg of sorts. I mean lets be honest. Who wants to hobble around a massive 100000 square foot store on crutches. But i am totally with you on your thoughts about it all. I think it is somewhat crazy. Have an awesome week! Hello again Q oh, how are you doing today my friend? Yes, my thought pattern aligns with your is nicely. As for those younger people with broken legs and such, of course somebody like that has a reason for using such a mobility device. Older people as well, if they have a serious issue. however, I feel that if somebody is able-bodied and uses such a device, that might be their first step towards actually needing it. One reason for the mobility options is the Americans with Disability Act (ADA). Overall it’s a real step up, but it has also caused some social disruptions. Think of disabled persons parking spots. My 600 Pound Life is a show my wife watches (she’s less than 100 pounds). I’m over weight, maybe eve obese, but I walk every day. I fight the weight just like you. Some of the problem is laziness (if you don’t exercise you tend to be stressed and eat to feel good). I know my dog chews everything if she’s not walked and I feel the same way. Some of the problem has to do with processed food – doesn’t sound like you had as much of that in the RP. Almost all of my weight came from eating out while traveling for my job – no such thing as small servings in most American restaurants. My wife and I have wondered about the drug ads for years. I certainly wouldn’t take most of those drugs. And I wonder if the cost of the ads aren’t part of the drug companies rational for charging Americans so much for those drugs. The ADA started in the very early 90s, under President George H.W. Bush, but these carts came much later. I had not considered the connection, but I can see where the mobility carts might have been a longer-term cause of the act. The carts are good because they help people who need them. But, I just wonder if or why so many people do need them. I have seen a couple of episodes of My 600 Pound Life. I find it interesting, and it motivates me to not go back to that kind of life. I find walking both fun and good for me. I like to explore new places where I have never been, go down streets that I have not explored, etc. Yeah, I would say I rarely ate processed foods in the Philippines, and I do eat some now, mostly just “trying them out” but I also don’t feel the need to keep going back for more, just sometimes try one that is different. Those drug ads, for me, are motivated to keep from using or needing them! They are scary, to be honest! As far as the electric carts, I’ve never seen anyone using them that probably didn’t need them. Even an obese person, if they get to the back of the store and can’t walk farther, there isn’t much they can do. It’s safer to just take the cart. I have MS and arthritis and no days are good, some are better than others though, so on the really bad days, I take a scooter. When my mom is with me, I let her ride the scooter to the car (she always uses one because of balance issues), then I drive it back inside. As far as health, I really think it’s the crappy food, all the processed stuff that is here and that I’m guilty of indulging in. Big Pharma, that’s where the money is at, it’s also who fills politicians pockets. When one of my meds cost over $7k a month, something is wrong with that picture. It is just my hope that some people can improve their health. I see so many people here who are unhealthy. I agree, bad food, processed junk food. Of course, for those who need a cart use it, no problem. I just wish that fewer people needed them. Seeing them was such a shock to me.